Friends and fellow officers in the United States Army prior to 1861, the fate of Civil War made them foes on the battlefield at Gettysburg. Confederate Brig. Gen. Lewis A. Armistead and Union Maj. Gen. Winfield S. Hancock were both wounded in Longstreet's assault (Pickett's Charge), July 3, 1863. Here at the Union Army 11th Corps Field Hospital (George Spangler Farm), Armistead died of his wounds on July 5, 1863. 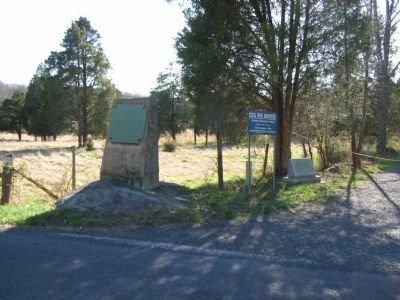 Northwest of this marker is the site of the Granite School House, a Union field hospital, where Hancock was initially treated for his wounds. Hancock survived the war, and became a well-known military, political, and civic leader. He died on active military duty at Governor's Island, New York, February 9, 1886. 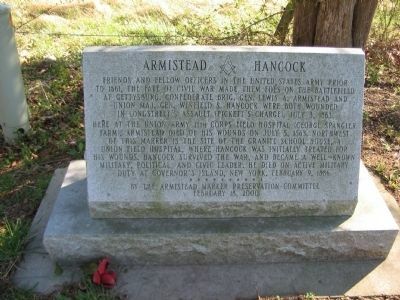 Erected 2000 by the Armistead Marker Preservation Committee. traveling south. Touch for map. Located at a lane leading to the George Spangler House, south of Gettysburg National Military Park. Marker is in this post office area: Gettysburg PA 17325, United States of America. Touch for directions. Other nearby markers. At least 8 other markers are within walking distance of this marker. Field Hospitals - Eleventh Corps (here, next to this marker); George Spangler Farm (here, next to this marker); The George Spangler Farm Civil War Hospital Site (about 600 feet away, measured in a direct line); A Farm Transformed by War (about 800 feet away); Armistead Death Site (approx. 0.2 miles away); A Hospital Under Fire (approx. 0.2 miles away); Well, Look What We Found! (approx. 0.2 miles away); The Trademark of Craftsmen (approx. 0.2 miles away). Touch for a list and map of all markers in Gettysburg. More. Search the internet for Armistead and Hancock. Credits. This page was last revised on June 16, 2016. This page originally submitted on April 13, 2009, by Craig Swain of Leesburg, Virginia. This page has been viewed 1,441 times since then and 15 times this year. Photos: 1, 2. submitted on April 13, 2009, by Craig Swain of Leesburg, Virginia.